By Aidan Kelly | April 30, 2013. It is a rarity these days to see a footballer who is plying his trade in Ireland don an international jersey at any age-level. However, the League of Ireland received a welcome boost in January of this year when St Patrick’s Athletic star Christopher Forrester was called up to the Ireland under Under-21s squad for their friendly game against the Netherlands. Forrester, who is a 20-year-old winger from the Smithfield area, has been lighting up the Airtricity League for the past two seasons, showing a level of composure, skill and maturity that belies his young age. His consistent performances were duly rewarded in January when Irish U21 manager Noel King decided that his displays warranted an international call-up. On hearing that he was going to get the chance to represent his country, Forrester felt a great sense of pride. “It was amazing; when I was first told I really couldn’t believe it. When I came in and actually played, it was an unbelievable experience. I was delighted with myself and how I did,” he said. Forrester first turned heads in the Saints’ 5-1 demolition of Shamrock Rovers in April 2012 when he netted a spectacular goal, showing an unbelievable amount of finesse and flair. The goal has since featured on popular Sky Sports TV show Soccer AM. 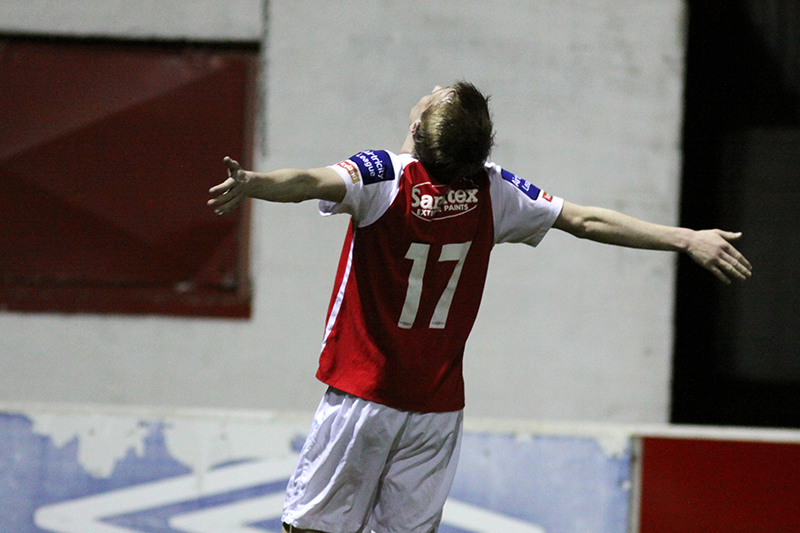 The goal also acted as the catalyst for him picking up the Airtricity Player of the Month Award. Forrester went on to represent St. Pats in their FAI Cup Final defeat last year and was named the club’s Player of the Season along with picking up the PFAI Young Player of the Year Award. One of the English-based players in the squad, Aston Villa’s 20-year-old midfielder Samir Carruthers, is a player Forrester particularly enjoyed playing beside. “Samir Carruthers has played in Old Trafford against Manchester United, so it was a bit surreal to be seeing him. I mean, it’s everyone’s dream to be playing against United there. Despite experiencing the glamour of international football this season, Forrester remains focused on his club’s immediate future. St Pats are currently sitting near the top of the table and look like genuine contenders for the Airtricity League title. The winger once again starred for his club in their 4-0 home drubbing over Shelbourne in April, grabbing an impressive hat-trick.